Each night, as I kiss my boys and tuck them in, I tell each of them one thing that we will do the following day.This could be something super exciting, like a trip to see the mummies at the museum (their all-time fav), or it could be something not-so-exciting, like undie shopping or toy organizing. Having this little ritual is something they look forward to. In fact, they now demand it. Heaven forbid I forget to give them a glimpse of the day ahead. As soon as they take note of my negligence, I am summoned back upstairs by a loud "MOMMMMMMMMMMMMMM!" I'm molding my children into little planners. It's actually quite thrilling. Last Sunday was a solemn night at our house. The two weeks for Christmas break had come to an end. Knowing they were far from excited about attending school the next day, I gave them something extra special to look forward to. 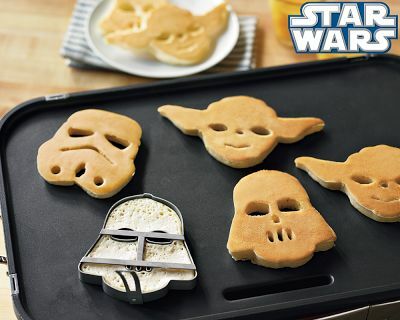 "We'll have Star Wars pancakes with chocolate chip eyes, cherry noses, and whipped cream smiles!" I boasted. Satisfied, they went to sleep. Waking up at 8:00 AM gave me exactly 40 minutes to shower, get dressed, get 5 kids dressed (okay, 4. Jack stays in his undies all day long), pack 2 lunches, stock 2 backpacks with overdue library books, water bottles & snacks, and make breakfast. Oh $h!t, breakfast! By now it was 8:15 and I remembered how I promised them Star Wars pancakes the night before. Tossing my guilt aside, I placed 5 different boxes of cereal on the kitchen counter and told them to choose. I turned my back to grab the bowls and that's when I heard the sound of faint whispering behind my back. The boys had huddled together and were asking one another what mommy had promised the night before. Red handed. They caught me. "But you promised!" They whined. 5 disappointed faces staring me right in the eyes immediately made me weak in the knees. The next thing I know, I'm clearing the counter of cereal boxes and making room for the griddle, as the boys rejoice with high-fives. I pull out my Williams Sonoma Star Wars pancake molds (thanks to Lynne and Kristin), and whip up a batch of GF pancakes. Thinking only an idiot would have to actually read a set of directions that accompanies pancake molds (and knowing I don't have time to waste), I fling the instruction sheet aside. F O R E V E V E R. For starters, they seem WAY too thick, and they're not detaching themselves from the insides of the molds like I think they should. Why? Because this idiot poured twice the amount of batter into the molds than what is required, AND I placed the molds on the griddle upside down. Nice, Amy. Real nice. Although I did what I could to keep the pancakes looking like Darth Vader, Yoda, and a Storm Trooper, I wasn't even remotely successful. My boys sat silent as I placed the disfigured pancakes in front of them. I told them to place their trust in me. These were indeed the characters they requested, they just happened to battle it out as I tried to put them on the plates. Silence. They needed time to process. Having no girls myself, I can only imagine the responses she may have when it comes to mangled pancakes. (I'm thinking tears.) No tears here! My failed efforts were rewarded by hoots and hollers. Oh happy day!!! They even argued over who's pancake won the battle. Amazing. Just ONE example of why I'm perfectly content having a house bursting with boys.